This post is in collaboration with RIO Washingtonian Center. All opinions mentioned are my own. Have you ever tried putting together a complete outfit from different stores in under two hours, while staying within an assigned budget? I hadn't until I collaborated with RIO Washingtonian for this project. I had given myself two hours to shop (as that was all the time I had that afternoon) and RIO Washingtonian had given me $250 to spend. I had to put together a complete outfit within that budget (shoes optional). But since I am an over achiever, I was able to create a head-to-toe fall look, with shoes INCLUDED and of course in under two hours. It was such an exciting and exhilarating experience. The positive of course was that I was getting to shop in-person for a brand new fall look and someone else (aka RIO Washingtonian Center) was going to pay for it. And while there is no negative to this situation, the pressure of finding everything within two hours mixed with the stress of bringing the complete look together since I will probably be judged as a 'fashion blogger' was quite unnerving. But SO MUCH fun! 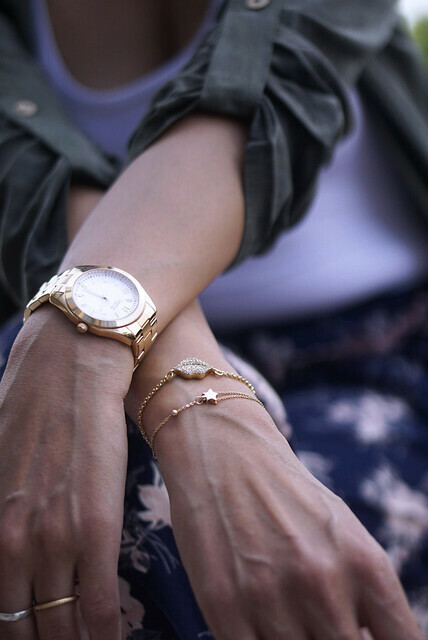 I started with a quick browse through some of my go-to stores at the Rio Washingtonian - LOFT, White House/Black Market, Charming Charlie, South Moon Under, and Francesca's Collections. I found a few separates (tops, duster, maxi dresses etc.) at White House/Black Market and South Moon Under but I couldn't see a complete outfit coming together yet. I needed a base layer which I could build upon. ... And ... then I found these fabulous fall-floral pants at Francesca's Collections. It was love at first sight. They screamed comfort and fall at the same time. The blush pink undertones in the print were simply a bonus as that's the color I have been lately most attracted to. So that was my first piece of clothing for the fall look. I also found a pair of large hoop earrings and a foldable clutch in the same shade of pink. Although usually I am not a hoop-person but something about them attracted me to them and I decided to run with that instinct. After picking up the pieces from Francesca's Collections I could practically see the whole outfit come together in my head. I had already put the khaki green duster on hold at South Moon Under and had my eyes on the versatile Steve Madden heels I had seen on the racks. And had already spotted had some pretty and delicate jewelry at Charming Charlie. All I was missing was a top/blouse but since the pants were the highlight of the outfit, I was willing to settle with a basic tank if I had to. My only concern at this point was I to stay within the budget of $250. But lo and behold, I made it within the budget and still have some change remaining. Scroll to the bottom for outfit breakdown. Don't forget to let me know what you think about the outfit look. A special shoutout to the retail team at Francesca's Collections and South Moon Under. They were so patient and wonderful throughout the whole thing and made my shopping experience so much more fun. Also, a big thanks to Steven, who took these stunning pictures at the RIO Washingtonian and totally captured the fall vibes I was going for. What a fun challenge! You did a fantastic job! I love the outfit! Sounds like an amazing challenge! Love the look you put together and it will be great for the fall months ahead! How much fun!! Your outfit came out supper cute and I love the pants. Well you did a fantastic job. 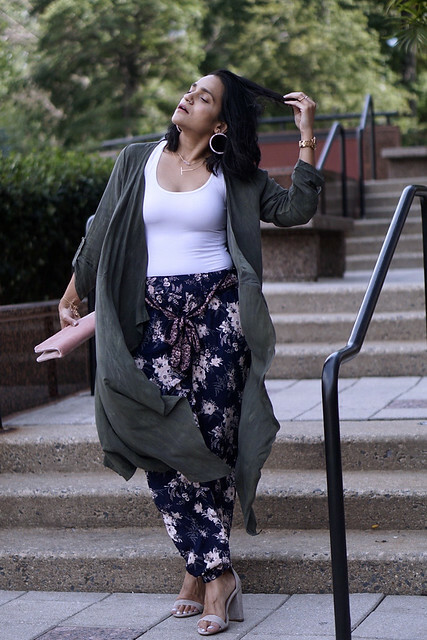 I love the pants and the duster I've had my heart on something just like for so long. This is an awesome outfit. I love the pattern on those pants! What a fun challenge! I've never tried before, but this would be something I would love to do - and I'd say you rocked it! I'm loving the floral! And the look is so fab too! Another winning outfit combo! Love everything you're wearing, especially those pants! OMG, they look beyond comfortable and stylish. I need a pair! I had to click the link to find out more about RIO Washington. It looks like an exciting place to shop. Beautiful outfits by the way. Omg Sound like so much fun! I wish someone would give me $250 to shop! Haha. In love with the pants! You have such a pretty style for dressing up or everyday wear. I love your accessories too! Tanvii you have such amazing style... I always love the outfits you put together! 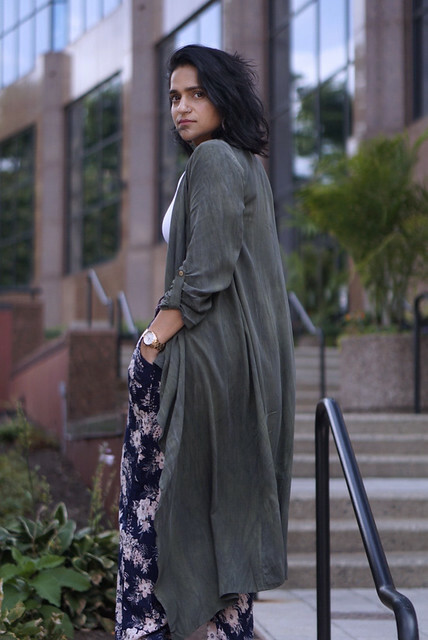 I loved the way how you've styled your entire outfit! That floral pants look absolutely gorgeous! It's not always easy to create a look with a budget and a time limit, but I think you nailed it. Really love the pants. This is an awesome challenge and you pull that off like a boss!! I can see why you fell in love with that pant, because I just did too. And the kaki blouse on top look fabulous! Well done! I love the way you styled everything! I specially loved the accessories!! I love how comfy but chic you look! The shoes are incredible! I guess you pulled this outfit beautifully. The body suit and the pants just complement each other. Love it. The outfit is stunning especially the pants. I'm in love. You did such an awesome job and I'm sure the team expressed that as well. Beautiful! I love how chic yet down to earth the style is! I would wear this in a heart beat. I love Francesca's and these pants look great! You should TOTALLY be a model! You did an AMAZING job on this outfit! What a very comfortable outfit! You look fabulous!! such a great outfits you really looking so glam on this outfits you great and you done a great job.. I will love to be able to do that too if I get the opportunity! The chance to pick your own outfits within a budget and best of all, not having to pay for it! Yes! I really love your whole outfit. Imagine you stay on Rio shop just to buy a complete outfit. But it's worth it, You chose a perfect and beautiful outfit. Loving your floral pants.